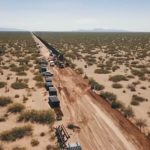 The American Border Foundation/ fundthewall.com team have been working diligently since September 2017 to create and solidify a crowdfunding platform that Americans can use to fund the wall using donated money. Having recently been awarded nonprofit status by the IRS, the last item on our list is having DHS agree to receive the funds and use them to construct the wall. DHS has a published process to receive gifts (found here), and the procedure covers all the questions we had regarding whether we could stipulate the use of the funds, etc. It’s quite clear. 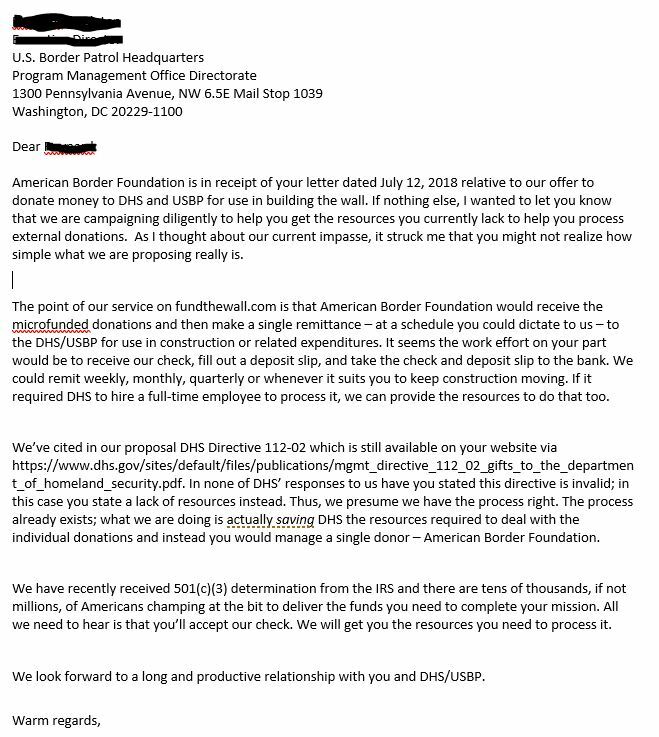 As we described in “Getting to Yes with DHS” we have been going back and forth with DHS via email and regular mail since December 2017 to request the approval of the Office of General Counsel for us to deliver the funds. Their most recent response to us is that DHS “doesn’t have the resources to process donations”. We find this to be non-sensical. The point of a crowdfunding site is that we save them the resources of processing the individual small donations and they would only have to manage our check to them on a weekly or monthly basis. America, we need your help. Many thousands of you have publicly said you’d be willing to donate and that means there are millions more who will participate. All we need to do is break this logjam and we can begin the flow of funds to DHS to use to build more sections faster. 1. Created a petition on whitehouse.gov. 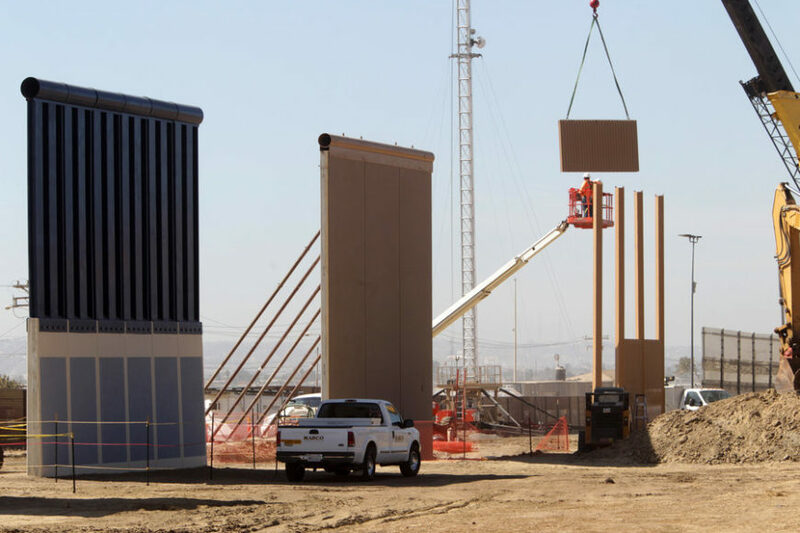 You can access the petition here: https://petitions.whitehouse.gov/petition/build-wall-14. If we are able to reach 100,000 signatures the White House is required to respond. This will mean President Trump will have reviewed our offer, and know how simple it will be to implement. It would likely result in the opportunity to participate in a Question & Answer session where we could describe the process and our service in more detail. 3. Written again to DHS through regular mail, their preferred contact method, to let them know we think they might misunderstand us. That letter is on its way and should arrive around the 21st or 22nd. 4. Sent snail mail to President Trump on the same topic, with functionally the same content. Should arrive at the same time as the last one. 5. Worked tirelessly to spread the word about these first three items on social media on the Internet and especially in real life. In particular we’ve been directly targeting groups of conservatives and American patriots who agree with us and will help spread the word. 6. Sent hundreds of messages to media and key conservative influencers to gain their support and visibility. Any one of these methods could be the one to get the attention of Secretary Nielsen or President Trump and get the right resources in the right place for DHS to be able to receive the money. For this one step, we have to ask America to help us make a connection we don’t have. Once we hav their attention, we can answer their questions and show them what we’ve done. We will get to yes, and we will fund the wall, America!